Amy's Creative Pursuits: Do You Think This Is a Military-Style Coat? This beautiful grey wool pea coat has been in my closet for decades. I almost donated it this year because I rarely wear it and I thought it was getting dated. It has a detachable fur collar (see in last two pictures of post). I purchased it on clearance from JCPenney at the end of the winter season and got quite a deal on it. 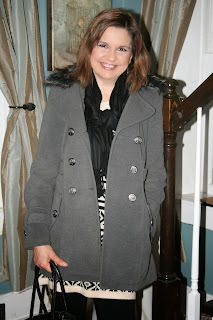 I decided to wear this coat for day of shopping and lunch with my hubby because it was actually a little warmer (if you call 30 degree temperatures warmer! haha!) and I had a long top on underneath that I wanted covered by my coat. I was also wearing faux leather leggings (Worthington, old) and wanted to be sure my backside was well covered. When the fur collar was on, it didn't seem to fit my outfit and it looked dated. But when I removed it, I thought it looked a bit military style; what do you think? Removing the collar gave the coat a more updated, cleaner look. I wore my coat with a black knit scarf, baker boy hat, Michael Kors studded gloves, black faux leather leggings, black combat boots, and I carried a black bag. To me, the buttons, pocket flaps, and belts on the waist and sleeves give the coat a military feel. I love the belt on the back of the coat. I can cinch it tighter to make my waist line look slimmer. There is a nice detail in the back too with all the seam lines. So what do you think? Military-Style or no? Is the coat still in style, or should I donate it? I'd love to hear your thoughts in the comments below. My gloves were a gift from my daughter. The Liz Claiborne Elizabeth Tote is from JCPenney. I purchased these cute lace up combat boots from Charlotte Russe for only $20.00 but I see they are sale on-line for $25.00. I just LOVE these shoes and I have been wearing them constantly since I bought them. They are super comfortable and totally practical for my climate and lifestyle. I get so many compliments on them! And if your wondering what I had under my jacket, a three year old grey and black leopard print sweatshirt! I pretty much left my coat on all day. The only time I took it off was when I was eating in a restaurant. And here is what the coat looks like with the fur collar attached. Sorry, I couldn't find any pictures where I the coat was buttoned. I love it! It's a keeper. You look amazing, sweet Amy, and the whole outfit it super. It's so lovely to rediscover things in our wardrobes, eh. Thank you! I'm happy I gave it a second look! Fabulous look! I love that coat and your pants are so cute! 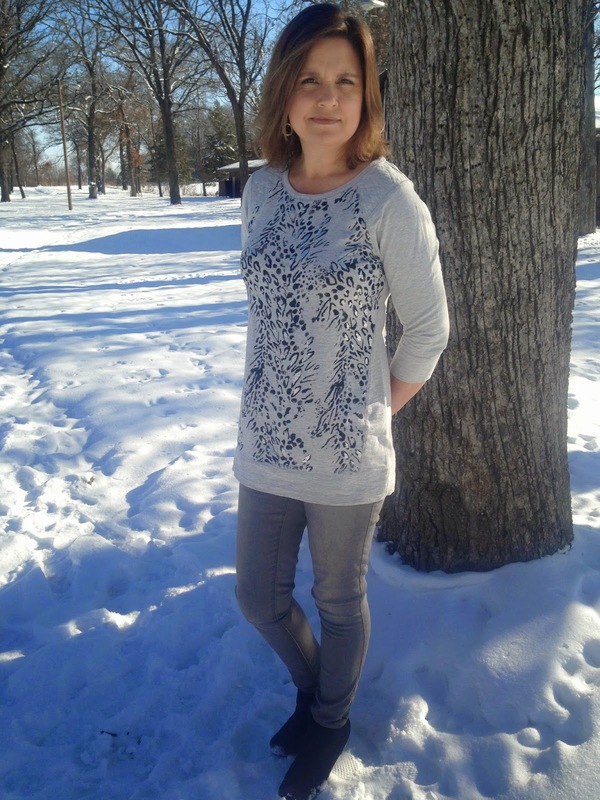 Stay warm and thanks for stopping by our Style Wise Link Up! I can see that it looks a little military, but it's also so classic!! And I love the fur portion too, Amy!! Funny my husband and I had a discussion about this type of a coat yesterday, he called it a military (navy) style pea coat (I had no idea, but he was in the military for several years so he must know). I love the coat and would definitely keep it. It looks nice with fur too. A really nice outfit all around and what a great deal you got on those boots! That is funny! Well, he would know then, wouldn't he? Thanks so much, I'm definitely keeping it now. I'm glad I gave it a second chance! This is such a cute coat! You should definitely keep it! That pea coat is so cute! Thanks Patti1 I really like the back too! I think it is a great coat and definitely get the military vibe. I think it is a definite keeper! Also, I have those same moto leggings and just love them. 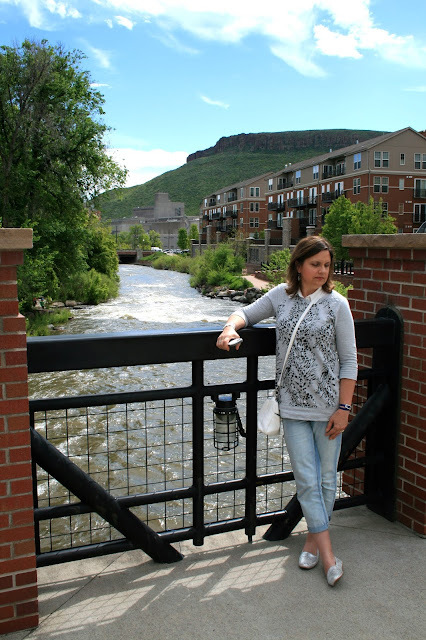 :) Thanks for linking up, Amy! Thanks Jennie! You're a JCP shopper just like me, so I'm not surprised at all you have these leggings too! I'm gotten so much wear out of them! Definitely worth the $20.00! The tailoring of the coat and style of the pockets does give it a military vibe, and if you think removing the collar gives it a new life, then run with it, I think it's a cute coat either way!